First row: C.C. Eaton, Dr. Thomas Albert Stafford, Elizabeth (Stafford) Eaton, Garland Reid Stafford; Second row: Elizabeth Stafford, Malissia Stafford Eaton, Marian Stafford; Third row: Walter Edward (Eddie) Stafford, Tom Eaton, Ann Eaton, Tim Eaton. 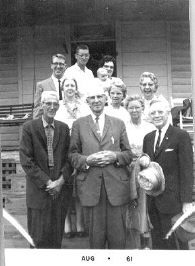 They were all together for the Stafford Reunion in 1961.